Members of the SLCJI’s first cohort of investigative storytellers will share the initial results of their work at a public celebration on Friday, April 2019 at 7:00 p.m. at the TAUNY Center (53 Main St.) in Canton, NY. This is a wonderful opportunity for members of the North Country community to learn about important local stories through the eyes of citizen journalists. NOTE: Please use the the back entry to the TAUNY Center (from the parking lot behind the building). Refreshments will be served. This event is free and open to the public. Please join us, and watch this space for more details! 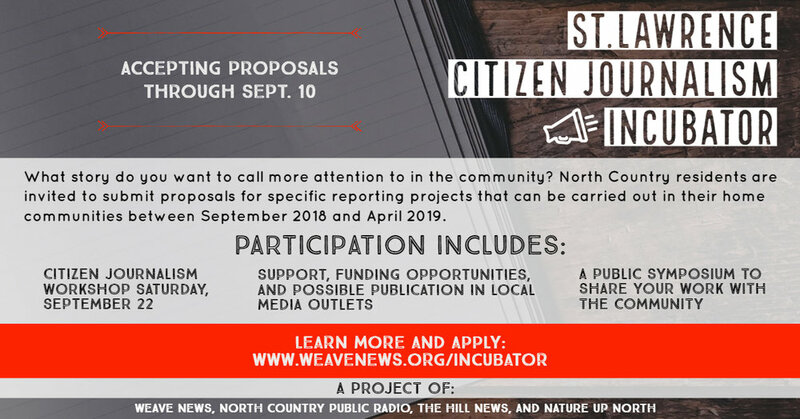 The St. Lawrence Citizen Journalism Incubator (SLCJI) is a new initiative designed to provide North Country students and residents with the opportunity to receive training and support for conducting independent, investigative journalism projects in their communities. Created with initial funding from a St. Lawrence University Innovation Grant, the SLCJI is a unique collaboration among four local media and citizen journalism organizations that bring a range of professional, citizen journalism, and citizen science experience to the project: Weave News, North Country Public Radio, The Hill News, and Nature Up North. The project will begin with an intensive workshop held on the SLU campus on the weekend of September 21-22, 2018. The workshop featured presentations and training sessions led by outside experts and members of the four local media organizations. Participants then began carrying out their local journalism projects, which will be presented at a public celebration to be held in April. this launch event will provide a chance for our first cohort of SLCJI investigative storytellers to receive feedback on their story ideas and training in the techniques needed to carry them out. in the spirit of community-based journalism, ***all of these events are free and open to the public***. please join us! Fiona Morgan is a freelance consultant based in Durham, North Carolina. Her company, Branchhead Consulting, works with philanthropic foundations, nonprofits, community-based organizations and others to support stronger local media ecosystems. A former alt weekly newspaper reporter, she earned a Master of Public Policy degree from Duke University, where she went on to research the economics of journalism with James T. Hamilton. For three years, she led the journalism program at Free Press, a nonpartisan nonprofit advocacy organization. She’s passionate about the power of public engagement to make accountability journalism vital and sustainable. Great ideas need to be nurtured into great stories. This interactive workshop invites members of the local community to help nurture the early-stage projects of our investigative storytellers into more concrete plans for gathering, reporting and sharing vital stories. We’ll use a conversation structure called pro-action café, in which project leaders consult with community members, drawing on their ideas, expertise and insight. The process invites deep questions and collective brainstorming to jump-start the creative planning process. All who participate in these conversations will help the projects that arise from the SLCJI grow deep roots in community. All conference participants who don’t have a student meal plan will receive a meal card than can be used for lunch at Dana Dining Center. We encourage you to continue over lunch the conversations that began during the Plenary Workshop. Each journalistic story needs to have a well-articulated central point: a relatively clearly defined issue or a tension that the author aims to address, as well as a set of characters that represent different sides of the story. The participants of this workshop will learn how to create the central point of the stories that they would like to address in their own personal inquiries. In the next step, we will go over some essential story formats that are commonly used by journalism professionals in their own reporting. Juraj Kittler teaches mass media and journalism classes at St. Lawrence University. He is a former journalist who was born in Czechoslovakia (today’s Slovak Republic). His professional career started in 1992 at the Slovak Radio in Bratislava. Later he worked for five years in Italy – as an editor and reporter for the Vatican Radio, and also as a foreign correspondent for the Slovak national newspaper SME. After he moved to the U.S. in 2001, he continued writing a weekly column dedicated to the analysis of U.S. politics. In 2009, he finished his studies at Penn State University where he earned a Ph.D. in mass communication, and soon after joined St. Lawrence University. Audio journalism comes down to one compelling voice telling a story you can’t stop listening to. In this workshop, we practice mic-ing your subjects to get good sound, asking the right questions, and being creative about gathering other kinds of sounds to help tell the story. We’ll bring it home with the glue that will wrap it all together – writing for radio and podcasts. David Sommerstein is an award-winning reporter and assistant news director for North Country Public Radio. He’s worked in public media for almost two decades and regularly contributes to national programs like NPR’s Morning Edition and All Things Considered, Only a Game, Here & Now, and more. He’s also produced podcasts, including the daily Story of the Day from NCPR. The mission of the Nature Up North project at St. Lawrence University is to help North Country residents strengthen their connection to our local environment and build bioregional literacy and environmental social capital. One way we strive to achieve this goal is through our website, https://www.natureupnorth.org. There we tell stories – the stories focus on education, advocacy, and awareness-raising. In this break-out session, we will look at the kind of stories we invite and the kind of stories we tell. Further, telling a good story includes knowing your audience, so we will also take time to consider who the Nature Up North audience is. Erika Barthelmess, PhD, is Piskor Professor of Biology at St. Lawrence University and director of the Nature Up North project. Her background as an environmental biologist (she studies porcupines as well as other North Country mammal species) and environmental educator, as well as her love for the North Country, led her to establish the Nature Up North project at St. Lawrence as a way to reconnect North Country residents with our environment and use citizen science as a mechanism to engage community members in learning important information about our local environment. For Round 2, we will repeat the same set of workshops featured in Round 1 in order to give participants the chance to attend two different workshops. Join our workshop facilitators for a free-flowing discussion of key ethical issues that confront all journalists (including citizen journalists). Bring your questions! John Collins teaches Global Studies at St. Lawrence University and is one of the organizers of the SLCJI. He is also a founder of the independent media organization Weave News and currently serves as its Director of Development. He earned his B.A. in Religious Studies from Wesleyan University and his M.A. and Ph.D. in Comparative Studies in Discourse and Society from the University of Minnesota. This workshop is for individuals who have been selected as members of the SLCJI’s first cohort of Investigative Storytellers. The focus will be on how to create a specific plan for the entire investigative process: from the initial idea through the field research to the creation of the final product(s). Participants will receive information on the SLCJI mentoring process and on procedures for requesting funds to support their work. This workshop is for individuals who want to learn more about the concept of citizen journalism, about the SLCJI and its mission, and about opportunities to participate in the SLCJI in the future. Join us for refreshments and conversation - a great way to conclude the day, meet new people, and keep the SLCJI momentum going! On the simplest level, citizen journalism is what happens when ordinary people take up the tools of journalism in order to investigate what is happening around them and share their findings with a public audience. The SLCJI is built on the belief that while high-quality, professional journalism is essential to the functioning of a healthy democracy, it is also possible for people without professional training to make important journalistic contributions under the right circumstances. While high school and college/university students are especially encouraged to apply, this program is open to all North Country residents who are high school age or older. We are seeking to select a multi-generational group for the first year of this project! Previous journalistic experience is not a requirement, but proposals must offer a clear description of the issue to be investigated as well as the reporting strategy to be used in investigating the issue. Doing citizen journalism work is a great way to make an impact on your community by bringing important local issues to light and giving greater visibility to the diverse perspectives found in local communities. It is also a great way to build a variety of skills, from research and writing to audio and video production. Thanks to the generous funding provided by St. Lawrence University through its Innovation Grants program, there is no participation fee for this project. Are there funds available to support individual projects? Yes! We will be offering a small number of mini-grants to support costs associated with selected investigative projects. When submitting your proposal, make sure you indicate whether you are interested in applying for one of these mini-grants. Even if you don’t have a project to propose this year, you can still be a part of the SLCJI! Our training event in September will be open to anyone who wants to learn more about citizen journalism and about the SLCJI. Attending these sessions would be a great way to begin the process of developing a project idea for year two (2019-20) of the SLCJI. You should also feel free to contact us at any time with questions.